July 23, 2018. 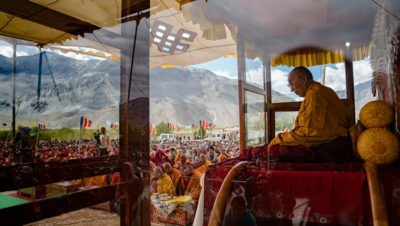 Padum, Zanskar, J&K, India – The sky was overcast and a steady breeze blew across the valley this morning as His Holiness the Dalai Lama emerged onto the veranda of the Phodrang. He spotted people peering through the main gate, eager to catch a glimpse of him, and more than fulfilled their wishes by walking down to speak to them. Where yesterday he had been escorted by horn-playing and censer-swinging monks from Karsha Monastery, today it was the turn of monks from the nearby Drukpa Kagyu monastery of Bardön. On his walk to the teaching ground, His Holiness stopped to greet and speak to people who lined the path, several times bending down low to engage with wide-eyed children gazing up at him with folded hands. But grow and increase more and more. “As you know, Buddha Shakyamuni lived about 2600 years ago, according to the common account. He was not enlightened from the beginning; to start with he was an ordinary being like us. But through meeting the right conditions and striving for many aeons to accumulate the two stores of merit and wisdom, he became a Buddha. Maitreya’s ‘Sublime Continuum’ refers to the four bodies of a Buddha—the natural truth body, the wisdom truth body, the complete enjoyment body and the manifestation or emanation body. “Everything in the universe is without inherent existence and our minds too have no inherent existence. However, because we cling to a sense of objective inherent existence, attachment, lust and anger arise, which are the ruin of us. Destructive emotions like these are rooted in ignorance. What enables us to overcome them is the fact that our minds are free of any inherent existence whatever. “The Buddhas’ complete absorption in meditation on emptiness is the wisdom truth body from which they can manifest in different forms. The complete enjoyment body is only accessible to bodhisattvas, but the emanation body is visible to everyone. Buddha Shakyamuni was an emanation body. Avalokiteshvara, Manjushri and Vajrapani, embodying compassion, wisdom and positive activities are aspects of the complete enjoyment body. “As I’ve mentioned before, there are teachings belonging to the general structure of the Buddha’s doctrine and others specific to certain disciples. This practice of Avalokiteshvara belongs to the second category. The Buddha prophesied that Avalokiteshvara would appear as the patron deity of Tibet and that his teachings would travel from north to north. One aspect of Tibet’s special connection with Avalokiteshvara is that some of the Religious Kings are regarded as his emanations. Songtsen Gampo who first introduced Buddhism is one and Trisong Detsen who invited teachers of the Nalanda Tradition is another. Avalokiteshvara is someone we can easily rely on. 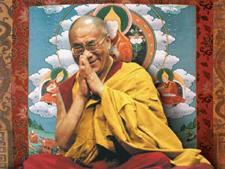 “The lineage of Dalai Lamas has a link to Avalokiteshvara. The 2nd Dalai Lama, Gendun Gyatso revealed clear signs of being the reincarnation of Gendun Drup. They and the subsequent Dalai Lamas have a special affinity with the Tibetan people. “I was born in the Kumbum region of Amdo and I was recognised by the Regent, Reting Rinpoche. As part of the process of finding me he went to Chökhor-gyal Monastery that was established by Gendun Gyatso on the shores Lhamo Latso, a lake dedicated to Palden Lhamo. “She has a special connection to the Dalai Lamas. When the First, Gendun Drup, founded Tashi Lhunpo Monastery, she gave him the Lhunpo part of the name. When Kachen Zöpa once told me that the Dalai Lamas belong to Tashi Lhunpo, I laughed and asked who prevented the Second Dalai Lama from staying there. As a result he moved to Central Tibet and extended his influence beyond Tsang. He became Abbot of both Drepung and Sera Monasteries and the enlightened deeds of the Dalai Lamas spread across Tibet. “The Third Dalai Lama, Sonam Gyatso, went to Mongolia and the Fourth, Yönten Gyatso, was born there. In due course, the Fifth Dalai Lama became political as well as spiritual leader of Tibet. This was a tradition that started with him, which I have brought to an end. “Regent Reting Rinpoche saw three letters—A, Ka, Ma—and other indications of my birthplace on the surface of Lhamo Latso. He interpreted A as indicating Amdo, Ka as signifying Kumbum and Ma as relating either to a monastery nearby founded by Karmapa Rolpai Dorje or to the fact that the boy who was sought had a girl’s name. As it happens, I was called Lhamo Dhondup. “In America and elsewhere I have joked that all the previous Dalai Lamas, including my predecessor, the Thirteenth, experienced visions, while I have had none. Despite that I have become the most well-known of them all. There is what we call a ‘dependent arising’ here. We lost our country, but as a consequence created connections with the rest of the world. “I have no special ability, but I practise sincerely, relying on the works of Nagarjuna and Shantideva. My faith is based on reason. As an ordinary being I have been able to serve the Dharma and sentient beings. Avalokiteshvara has one thousand eyes and one thousand hands, but on an occasion like this he has to act through me. “The people of the Himalayas also have a strong association with Avalokiteshvara. I don’t know whether I’ll be able to come here again, so I thought I might give this empowerment. I performed a divination before Avalokiteshvara to decide and it turned out well. In the course of giving the initiation, His Holiness gave the Bodhisattva Vows and led the audience through the All-encompassing Yoga by which they are introduced to an experience of altruism and emptiness. He remarked on the need to learn by listening to or reading the teachings, reflecting on them and achieving conviction in them. This requires the use of logic and reason rather than mere faith. In addition, he added, it’s essential to develop a warm heart. When he had completed the Avalokiteshvara empowerment, His Holiness made a point of reading the Manjushri prayer and transmission of his mantra to the school-children before him. He told them it had helped him sharpen his intelligence when he was young like them. Addressing the whole audience once more, he told them he had given teachings and the Avalokiteshvara empowerment, but still urged them to realise the importance of friendship, harmony and cherishing a good heart. Where there has been a falling out, friendship should be restored. There followed offerings and prayers for His Holiness’s long life, beginning with a recitation of the ‘Praise to the 17 Nalanda Masters’. Local people bearing offerings processed past the throne. As the ceremony came to an end, women in traditional Zanskari costume sang and danced in front of the stage. “You have performed this prayer for my long life with unwavering devotion,” His Holiness declared, “such devotion will bear fruit. Since friendship and goodwill are so important, remember that as human beings we are all the same. There is no use in thinking in terms of ‘us’ and ‘them’. If the followers of different spiritual traditions practise sincerely, harmony will naturally prevail. “I often point out that India is a living example that different religious traditions can live together in friendship and respect. This has been the situation in India for a thousand years; therefore it can also be achieved in other parts of the world. A photograph was taken of the community representatives with His Holiness. Waving to people in different sections of the crowd on the way, His Holiness returned on foot to his residence in the New Phodrang.